BSFG advocates and lobbies throughout the year, writing letters to politicians and organising petitions. Given the current political climate in relation to climate change and renewable energy our advocacy role is becoming even more important. Former BSFG President and active lobbyist! 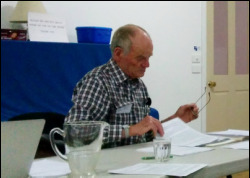 BSFG members regularly contribute a sustainability perspective to community consultations and forums in Benalla and North East region of Victoria. BSFG is regularly represented in consultations such as Sustainability Victoria's Community Consultations in Benalla and in local council planning initiatives with a futurist perspective. BSFG produces a quarterly newsletter containing well informed articles written by BSFG members. This highly valued newsletter is sent to members of NEA and is published shortly after release on this website. BSFG's website, launched in October 2015, incorporates interactive features suited to an 'advocacy' and lobbying such as a news 'blog'; calendar; embedded twitter news feed; links to Facebook and Twitter accounts and 'apps' which provide updates of, for example, energy consumption. The website is being improved continuously. Please consider providing feedback through the 'Contact Us' page. BSFG's social media posts on Facebook and Twitter provide links to well informed news reports related to sustainability. 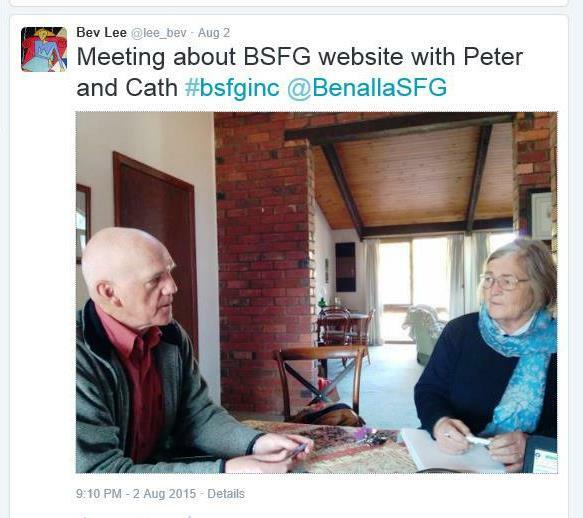 Our twitter feed @BenallaSFG is a key feature on the home page of this website. You can also find it via the 'twitter' logo in the footer on the website. BSFG's Facebook account can also be accessed via the FB logo on the website.